As I have mentioned in passing a few times, I have obsessive-compulsive disorder. It's usually not a big issue. The compulsive part mostly manifests itself as stupid quirks, like the way I can't buy a hazelnut Ritter Sport without checking that there's a hazelnut in each corner, though a year ago I had a very, very bad March and the stress made it flare up in a big way, such that I would get stuck repeating words or phrases. The obsessive part is a bigger problem, though. My apartment is too small for me to realistically have a cat, but I do sometimes look at the local shelters' available cats to see which ones I might get if I were in the market for one. Recently I was doing that, and saw that some of the cats were marked "*URGENT*". That got me thinking, and then abruptly I looked at the clock and realized that I'd spent a solid fifteen minutes dwelling on a scenario in which I went to get a cat and the shelter people demanded that I take one of the *URGENT* ones and I said I wanted a different one and the shelter people said that in so doing I was condeming the *URGENT* ones to a needless death and etc. and etc. Another manifestation: I went to dinner with about twenty people in the narrative gaming community. When it came time to pay, people were passing around the check holder and throwing in the amount the owed, and when it got to me, I couldn't pass it onward without organizing the money first. I got a multi-volume collection of obscure '80s music to listen to on my daily run. Suddenly a lot of inside jokes in high school make a lot more sense! I see that apparently Major League Baseball is experimenting with some new rules designed to speed up the game: batters needing to keep a foot in the batter's box, stuff like that. It seems to me that if you really want to speed up baseball, and make it more exciting, there's a simple solution. If a team completes its half of an inning on offense and is still behind, it comes to bat again. And it goes again and again until it is no longer behind. If a team plays offense nine times and is still behind, the game is over. Not only would this get most games over with a lot faster, but it would eliminate those terrible half-innings when a team is already up 14 to 2 but still has to bat even though striking out and going home is a more appealing prospect than scoring more meaningless runs. You may have heard of Tetris effect, wherein after playing Tetris for a while you start to see the interlocking shapes in your shower tiles or even in your dreams. It's more general than that; I've probably mentioned that after playing Europa Universalis I found myself automatically moving to click the pause button every time I wanted to take time out from my life to write an email. Recently I've been playing a bit of Lemmings, and urgh — I haven't dreamed about the Lemmings themselves, but I had to take a break after too many dreams about building stairways and digging mineshafts. No, no, no! If there's only one comment, then you have to make sure that the program prints the word "Comment" — that's "Comment", singular! Why can't you be more like the Deseret News? It was brought to my attention that this month the New York Times launched an NCAA tournament pool using precisely the system I created and published five years ago (and eventually coded up in PHP). I guess next month I can look forward to "Wikipedia Brown by Maureen Dowd". Life with anhedonia: someone on my Facebook list posted a link to this video of a dog trying and failing to catch a variety of food items in its mouth. I found it mildly entertaining. Which is why I was surprised to hear myself cackling for a solid minute and feel myself shaking with laughter. I didn't experience the amusement that went with that physiological reaction — whatever part of my brain was delighted by the sight of a donut bouncing off a dog in slow motion, it was not the part where my consciousness resides. "Okay, we can afford three signs. What should we put on them?" "Obviously, PIANOS on the top one. Then we should also put RENTALS and REPAIRS." "And that makes three. Great, that was easy!" "No, wait! 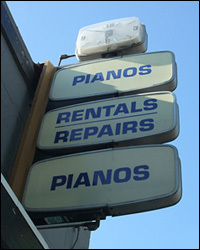 RENTALS and REPAIRS should be on the same sign." "Uh, all right. Then what goes on the third sign?" "Oh, just put PIANOS again."